To serve online publishers and the affiliate market- that’s the basic notion on which Cuelinks was conceived. As publishers themselves, Jimish Jobanputra and Mehul Jobanputra, the co-founders of Cuelinks realised there was a need to have a better link management and reporting solution in place to make publishers’ lives easier, so that they could concentrate better on their primary job i.e. content creation. Thus, Cuelinks was born to eliminate all the ugly hassles of affiliate marketing like following up with merchants for payments, campaign updates, reporting, understanding deep-linking, sub-id tracking et al. Secondly and more importantly, Cuelinks has helped online publishers earn more revenue by providing them the right technology to monetise their content and access to thousands of online merchants and affiliate networks in one place. 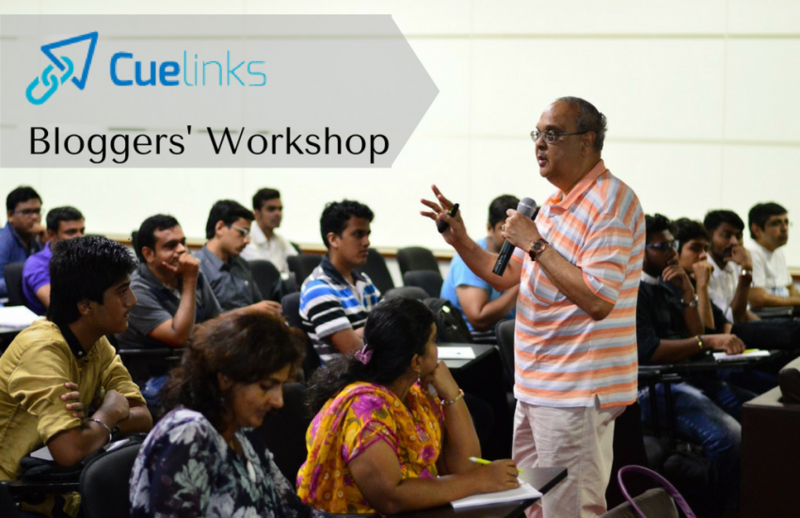 As an extension of this mission to enable publishers to earn big through their content, Cuelinks had organized the first annual Cuelinks Bloggers’ Workshop on 9 July, 2016 in Mumbai. Attended by around 100 bloggers, the Workshop was an opportunity for debutant bloggers to interact with leaders in the blogging space and learn the secrets of driving huge traffic and successfully cracking content monetization. The key speakers at the event were: Kulwant Nagi and Ivan Bayross. While Mr Nagi is an internet entrepreneur, blogger, writer and affiliate marketer, Mr Bayross is an author and Digital Marketing mentor with over 15 years of experience. Our second speaker, Ivan Bayross is a technical author, enthusiastic blogger and a digital marketing mentor. He has over 15 years of experience in Marketing & Digital Marketing and 30+ years of experience in Application Development. As a Digitial Marketing mentor he helps his clients multiply their income using tried, tested and proven methods of Digital Marketing. Some of his clients are Conversion Pundits, The Bike Zone, Media Vision, My Casting Net, and Gurus of Dance. He conducts webinars on Joomla, WordPress, Bootstrap and Digital Marketing regularly. At the Cuelinks Bloggers’ Workshop, he had some amazingly great insights on how to engage visitors on your blog or site and how to ensure that they convert in to buying customers. Starting right from the type of content you need to focus on down to making detailed customer personas, Ivan discusses everything that can benefit a newbie in the blogging or online world to a great extent. Use a combination of Copy, Images, Videos and Podcasts to engage your visitors. The greater the number of senses that you involve with the visitor, the higher your chances of selling. Write your blog in a language that your target audience would be most comfortable with. You can host a blog in any Indian regional language to any international language with just a small plugin. When everyone is your customer, no one is your customer. Create a Customer Persona i.e. a fictional representation of your ideal customer. Don’t write about what you have to deliver but how you can add great value or be of great help to the site visitors. What exactly is a landing page? What constitutes a perfect landing page that generates leads? How to figure out which of your leads will potentially convert into a customer and how to chase those leads? What is a Value Proposition? How to deliver a value proposition in your blog/ site to earn money? In order to not miss the next Cuelinks Blogger’s Workshop, keep an eye on this blog or sign up with Cuelinks for free now. good affiliate program I am using on my website.